My love of roses is shared with many gardening friends from all over the world. There are some roses which we all know and love, while others are famous only in their country of origin. Here are some of the best loved New Zealand roses. Here's my selection of favourites, with most of the photographs taken at other gardens. 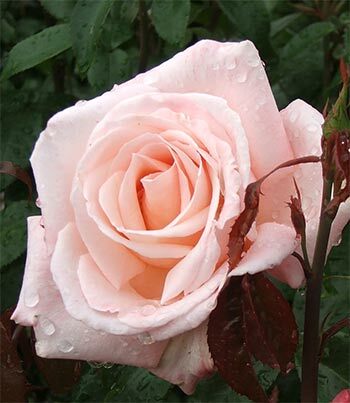 Particularly if you're a lover of hybrid teas you'll enjoy these new roses. Hybrid teas have been rather thin on the ground in my rose pages - you should finally see some real beauties! Some roses arrive in my garden without fuss. They grow, they demand little, and they bloom beautifully. Taken for granted? Yes, it's definitely that way with the coral-pink hybrid tea Paddy Stephens. I'm worried about naming a rose after one of the most impressively amazing creators of all time, Michelangelo. Could there be a rose grand and impassioned enough to encapsulate this famous Renaissance man? Which colour or flower form could do him justice? On one of my budget recycled rose-buying sprees I undertook to give a good country home to the yellow rose Ivey Hall (AKA Golden Smiles). This rose has a strong local connection, taking its name from the original building at nearby Lincoln University, in Canterbury, New Zealand. Royden is one of the new roses I chose for the Birthday Garden - my sneaky birthday present to daughter, where I spent lots of money on heaps of roses, pretended it was a real birthday present, and felt completely justified - generous, even! Blue toned roses, roses which look hand-painted with vibrant crayons, big blousy beauties - and delicately shaped hybrid teas - there's a Sam McGredy rose for every rose lover, just waiting to be purchased and planted in your own garden! Sam McGredy's roses are strong and vibrantly coloured. This man isn't a slave to pastel - his flame reds and sunset colours are warm and evocative. The rose bushes have big flowers, with big blooming impact. Sam McGredy came to New Zealand from Ireland in the 1970s. He has brought stunning, fruity colours and exquisite lush flowers to the rose world, from his flouncy hybrid teas to the subtle hand painted roses like Old Master. My first Old Master was a standard rose I bought for five dollars from a sale at a local Crematorium. One of Sam McGredy's 'hand painted roses', it looked superb in Middle Border surrounded by self sown white and lime green Nicotianas.